If the following chart has a familiar look, it should. Although people watching the stock market on Christmas Eve got the equivalent of a lump of coal in their stockings—a 2.71% nosedive by the S&P 500 (SPX) on a traditionally quiet-as-a-mouse day—since then the market has pretty much been the gift that keeps on giving, with many stocks putting together tape-busting gains off their December 24 lows. Social media—like any other media—remains a game of eyeballs (or ears)—getting them, keeping them, and growing them. Because more eyeballs means a bigger advertising audience, and media still runs mostly on advertising. So, in addition to its headline earnings and revenue numbers—which Twitter has usually beaten over the past five years2—people will likely be paying attention to those eyeball numbers, as well as the company’s longer-term advertising strategy. 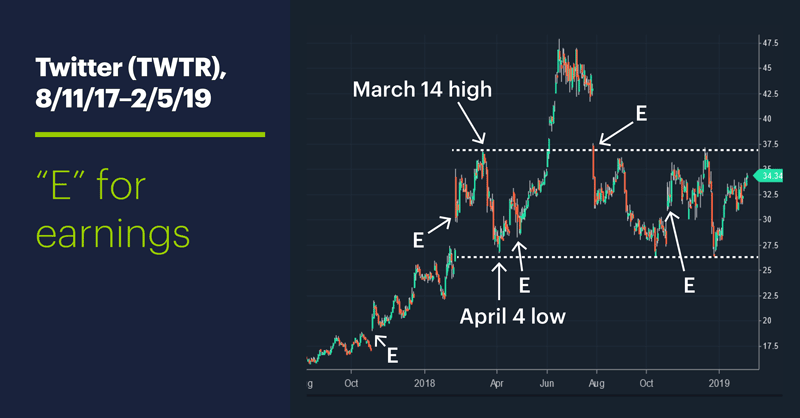 The chart above also shows that, aside from an excursion above it in June-July 2018, TWTR has spent the past year almost exclusively in a range between $37 and $26, first defined by the March 2018 high and the April low three weeks later. The stock’s December 24 low tested the bottom of that range; the volatility exhibited after the five most recent earnings releases suggests a test of the upper boundary is certainly possible. There are never any guarantees when it comes to earnings—other than volatility—but traders will likely be watching this one closely. 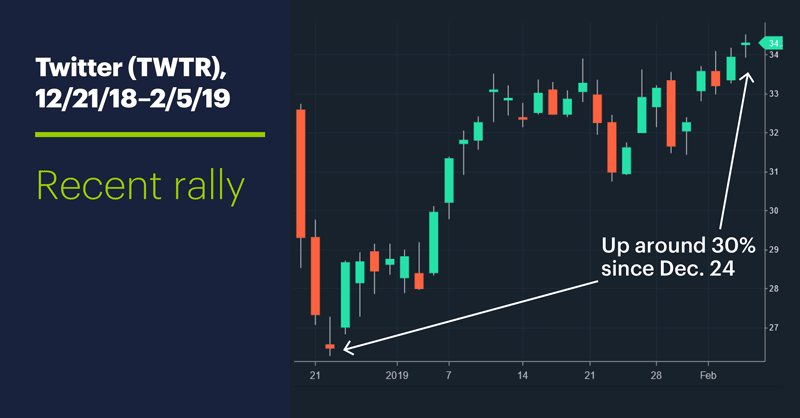 Market Mover Update: Dropbox (DBX) followed up on Monday’s up move with another big rally yesterday, gaining more than 2%. Boeing’s (BA) jump a new record above $400 highlighted the year-to-date strength in defense and aerospace stocks (see “Defense takes the field”). Industrials still lead all S&P 500 sectors this year, and the defense and aerospace sub-sector leads industrials with a nearly 18% YTD gain. Today’s numbers (all times ET): International Trade (8:30 a.m.), Productivity and Costs (8:30 a.m.), EIA Petroleum Status Report (10:30 a.m.). Today’s earnings include: Boston Scientific (BSX), Cognizant Tech (CTSH), Eli Lilly (LLY), General Motors (GM), New York Times (NYT), Regeneron Pharma (REGN), Spotify (SPOT), Take-Two (TTWO), FireEye (FEYE), Immunomedics (IMMU), Match Group (MTCH), NETGEAR (NTGR), NXP Semi (NXPI), Sonos (SONO). 1 MarketWatch. Facebook worth $45 billion more after earnings set it up to be potential ‘comeback story of 2019’. 1/31/19. 2 StreetInsider. Twitter, Inc. (TWTR) Earnings. 2/5/19. 3 Zack’s Equity Research. Robust Video Content to Drive Twitter's (TWTR) Q4 Earnings. 2/5/19.